They have risen not by mortgaging the club’s future, but by focusing on youth development and links with the community in the sprawling Lanús area. 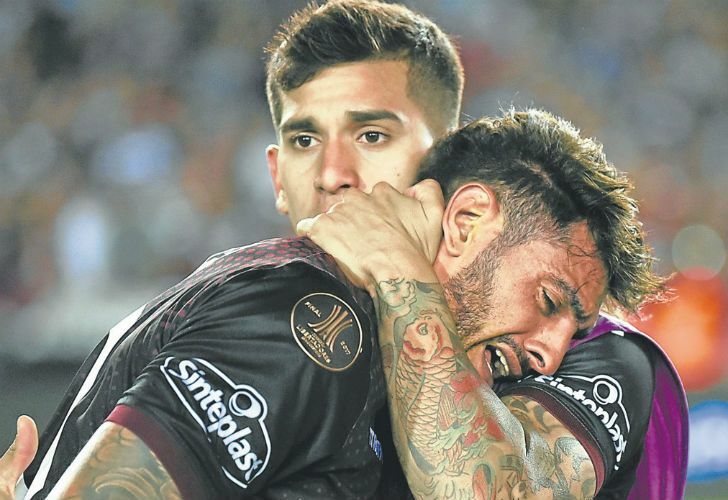 Lanús players console each other after their defeat in the Copa Libertadores final to Gremio. Foto:AP. Unfortunately for the thousands of Granate fans that packed the Estadio Ciudad de Lanús on Wednesday, another memorable Copa comeback proved just out of reach. Lanús followed up their 1-0 first leg defeat against Gremio with a 2-1 reverse on their own turf, meaning it was the Brazilians and not the team from the south of Buenos Aires left celebrating with the Copa Libertadores trophy. Defeat, however, detracts absolutely nothing from a thrilling campaign that confirmed the club’s position as one of the strongest and – perhaps even more important – healthiest institutions in Argentina. Even if the crown remained just out of reach against a Gremio side packed with young stars with big futures, merely reaching the final marks a wonderful achievement. Coach Jorge Almirón has worked wonders with a limited budget at Lanús, putting together a squad that not only wins games but also generally wins them in some style. Almirón entered the Grana back in 2015 on the back of a failed stint with Independiente and with everything to prove. He was charged with improving on the formidable legacy left by Guillermo Barros Schelotto, who had established Lanús amongst the Primera Division’s front-runners and delivered a Copa Sudamericana title in 2013 before leaving when Boca Juniors came calling. It seemed an impossible task, particularly as, unlike in Avellaneda, Almirón was given restricted funds to build up a team that was beginning to flag under El Mellizo. But with shrewd purchases and squad building the trainer was able to outstrip anything Barros Schelotto achieved. The standard-bearer of his time at the club has been José ‘Pepe’ Sand, the journeyman striker who in just three years has gone from playing in the Nacional B with Corrientes club Boca Unidos to taking the Libertadores top scorer crown. Sand netted nine times in this campaign, including two goals in an amazing semi-final comeback from 3-0 down to beat River Plate in the semis. There are plenty of other success stories. From Racing Club reject José Luis Gómez at right-back to veteran midfielder Román Martínez, picked up in 2015 after he was discarded by Estudiantes, Almirón has put together a team short on star value but big on collective spirit, and took Lanús to just their second league title in history in 2016. Now, with this final appearance, his place in Grana history is assured. For many years Lanús have been held up by observers as the example of a ‘model club’ in the turbulent environment of Argentine football. Thirty years ago the Grana stalked the netherworld of Argentina’s lower leagues, falling as far down as the Primera C before beginning their long ascent to the top. They have risen not by mortgaging the club’s future, but by focusing on youth development and links with the community in the sprawling Lanús area. As anyone who lives in the area will attest, the team pays admirable attention to municipal activity, providing a space to youths and bringing together even those who aren’t Granate fans under their umbrella. Instead of debt and crisis, the last three decades are a story of sustained growth and success on and off the field. And while Libertadores victory proved a step too far, and Almirón’s brilliant stint with the club may be nearing its end after two excellent years, the future still looks bright for everyone involved.